The overall health and wellness of drivers are rising concerns in the transportation industry – not just because companies care about their employees’ wellbeing, but because health issues are increasingly contributing to the driver shortage. New health regulations are taking drivers off the road and chronic health issues are forcing early retirement for others. Injuries to drivers come in forms you likely expect, such as slips, trips and falls. But they also come in forms you might not expect, like cumulative injuries from wearing the wrong gloves, jackets or boots. The impact on hands and legs or back strain from footwear both contribute to lasting injuries that create time-loss, reduction in productivity and costly worker’s compensation claims. The wrong boots don’t just affect the feet. Improper footwear can create lasting damage in drivers’ legs and backs. Gloves not designed for the duties being performed, like loading and unloading, can’t protect hands from the cumulative damage of repeated impact. 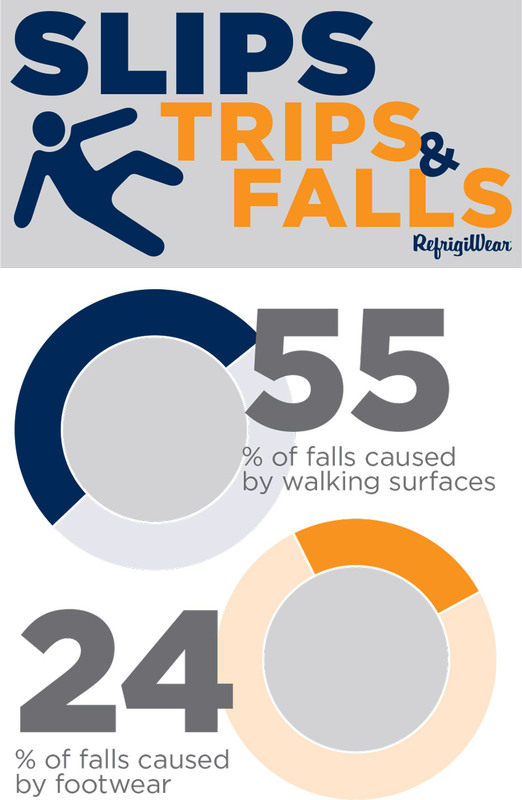 Drivers are in the top 5 professions most affected by slip, trip, and fall injuries – injuries that average 38 days of lost time per employee. Properly outfitting your employees in gear designed for their duties and the conditions they encounter helps reduce these risks and keeps productivity high. Each piece of the protective gear you provide to your drivers plays a vital role in their health. Truckers are twice as likely to suffer from chronic illness and injury as other members of the workforce.1 Protecting them from cumulative injury will help lower that number. GLOVES: Repeated impact from loading/unloading and handling cables and chains can lead to cumulative musculoskeletal disorders that take your drivers off the road. Providing gloves that protect from the temperatures they encounter in and out of the truck, plus provide impact protection, help reduce these concerns. Additionally, look for gloves with a pre-curved ergonomic fit – this reduces hand fatigue. FOOTWEAR: Boots with non-slip outersoles designed not to crack in the cold are important, but equally important and often overlooked are the ergonomic features of the insoles. Look for boots with systems like VitaComfort™ - designed to keep feet free from moisture and fatigue and reduce strain on legs and backs. JACKETS AND PANTS: Usually the only thing considered when choosing protective clothing is if it will keep the driver warm. But the fit and design of the clothing can play a vital role in ergonomics and therefore health. If the gear restricts movement it can lead to injury. Make sure you consider fit during all activities when choosing garments. The focus on getting drivers to pay more attention to their diets, exercise regimens, tobacco use and sleep habits is pivotal in a Driver Health & Wellness Program. It is important, however, not to overlook the role ergonomics and repeated duties play in overall driver health. Including thorough PPE guidelines and best practices in Driver Health & Wellness Programs ensures the complete picture is being seen and addressed. Providing the best gear to your drivers helps keep them healthy and productive.